In 1981 the unexpected appeareance of opportunistic infections and Kaposi’s sarcoma in homosexual men in the United States marked the beginning of the AIDS epidemic . Shortly thereafter the observation of an increasing number of male homosexual subjects suffering from high-grade non-Hodgkin’s lymphomas [6, 15, 16] resulted in the inclusion of this hematological malignancy in the Centers for Disease Control (CDC) definition of AIDS , As early as 1983 the retrovirus responsible for this major immunodeficiency state, now called human immunodeficiency virus (HIV), was discovered [3, 11]. Since then the HIV infection epidemic has been spreading rapidly by means of sexual and intravenous transmission routes in America as well as in Africa and Europe. The discovery of different types of hematological and non hematological malignancies in AIDS patients and HIV-positive subjects led us to create a French register of HIV-related neoplasia. 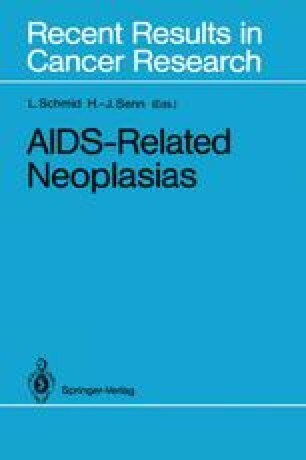 This paper reports the first 68 cases of hematological malignancies identified in this register between 1983 and June 1987. This work was supported by Ligue Nationale contre le cancer and AREMAS. For the French Registry of HIV-Associated Tumors.